Whatever Kyle Crick did during those two months of oblique-strain rehab worked. Crick has returned and been far more dominant than his three starts prior to hitting the disabled list, including another 10-strikeout showcase Wednesday night against Modesto. His WHIP is down from 1.97 to 0.98. K/9 is up from an already good 11.2 to an absurd 16.4. K/BB is up from 1.33 to 5.60. Etcetera. The fastball sat between 94 and 96 and topped out at 97 at least six times. As usual, hitters had a difficult time catching up to it. He just blew it right by them. As the game wore on, Crick became more comfortable with the power curve, which was thrown anywhere from 78 to 83 MPH. At one point, Crick threw three consecutive curveballs, includuing a called strike-three. The curveball command was especially impressive on Wednesday night. Crick had plenty of success pouring the curve in for a first-pitch strike and throwing it for swing-and-miss and called strike-threes. 1. He successfully takes a few MPH’s off the fastball and improves command when behind in the count. I noticed on three separate occasions tonight, Crick had 3-0 or 3-1 counts on hitters and threw a 92 to 93 MPH fastball for called strikes. 2. The kid bears down with runners on base. On the season, opposing hitters bat .159 with 21 strikeouts with runners on base compared to .277 with 19 strikeouts with the bases empty. In front of his mother who flew to California to surprise him, Mac Williamson homered for the fifth time in his last eight games. He also singled to record his fifth multi-hit performance in his last six games. The hot streak includes 11 hits, two doubles, five home runs and 11 RBIs. This comes on the heels of an already hot June, which helped the Wake Forest product rebound from a slow April and May. Williamson batted .320 in June with six homers and 21 driven in after batting just .235 with six home runs and 20 RBIs in April and May combined. 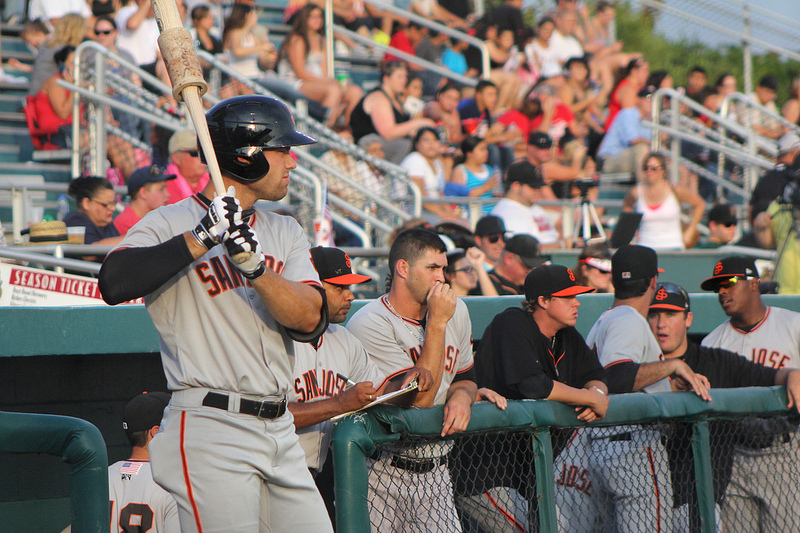 The San Jose Giants received a six-out save from Jose Casilla to close out the ballgame 7-6. Left fielder Devin Harris hit his team-leading 18th home run and totaled four RBIs on the night.